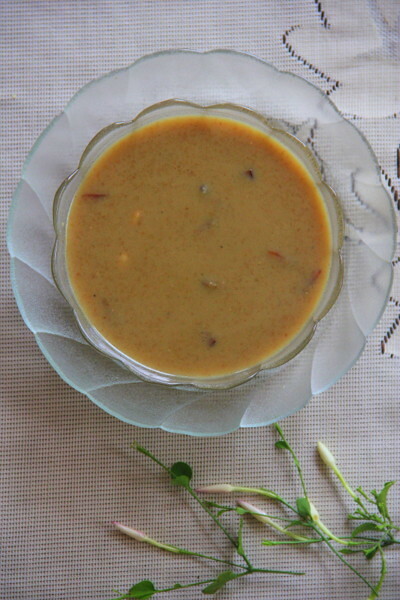 Spicy Chilly: Godhambu Rava Payasam / Wheat Rava Payasam (with coconut milk and jaggery). 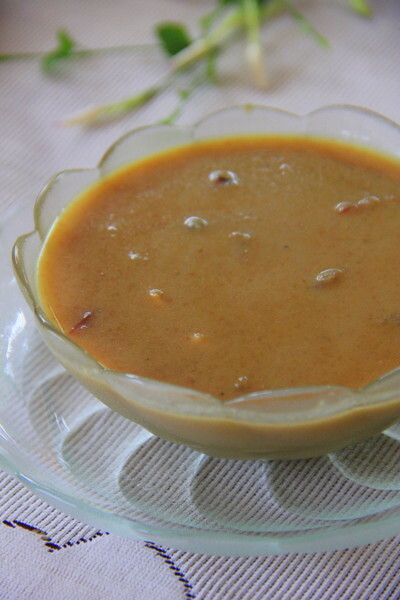 Godhambu Rava Payasam / Wheat Rava Payasam (with coconut milk and jaggery). If Amma decides to cook on a festival day, we can expect a feast. 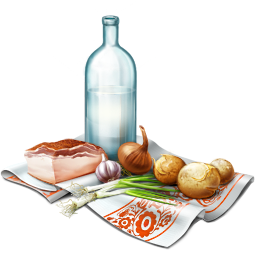 She would spend hours of hard work in her kitchen, expecting less help from others, comes out with the authentic festival recipes. This Diwali she thus made this yummy and creamy Godhambu Rava Payasam along with crispy 'parippu vadas' and sweet 'pal vadas' paired up with an elaborate lunch spread! Or you may go ahead with canned/tetra packed coconut milk. We have to extract milk from a large coconut which yields 4 cups of shavings. 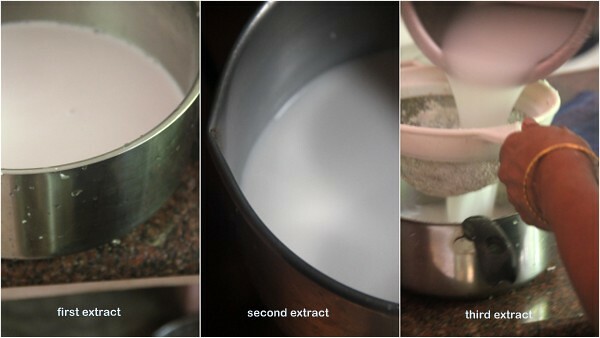 How to extract milk is here, featured by sis following mom. 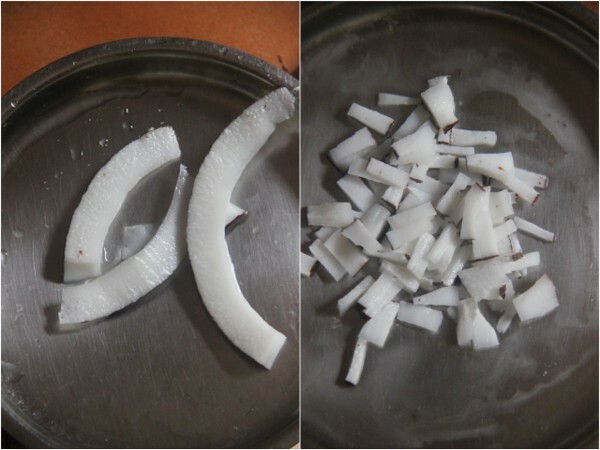 Loosen thin strips of coconut from its shell which yields 3 tsps of bits, after the strips are cut. 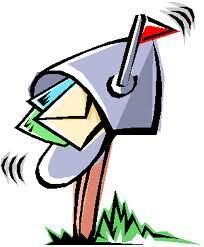 Set this aside. Transfer rava to a deep, wide and thick bottomed pan. I used a 5ltr pressure cooker body. 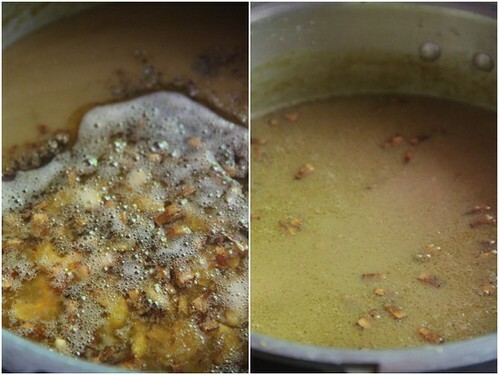 Cook rava in 3 cups of third extract for around 8-10 minutes. You need not close the pan. Add second extract. Keep stirring and simmer cook further for 8-10 minutes. Crush jaggery into small lumps. Add a cup of water and bring to a simmer. Stirring now and then, melt the lumps completely. This will take around 10 minutes. Strain melted jaggery ( the one you see here has a metal mesh. Do not use plastic mesh as the piping hot syrup will destroy it. 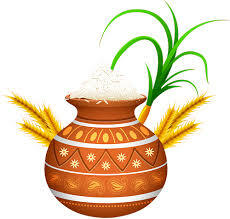 If you use plastic ones, wait till the syrup cools downs and then strain) and add along the payasam. 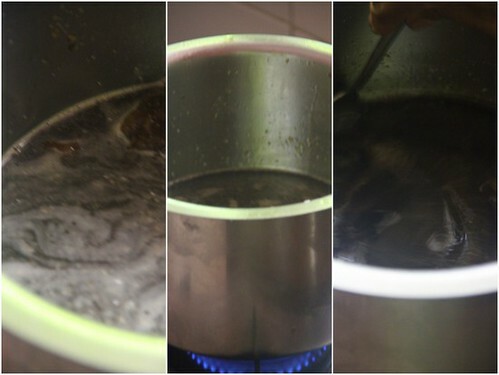 Simmer for 8 minutes stirring all the the time until the payasam gets thicker. Add the thickest first extract and stir along switching off the stove. 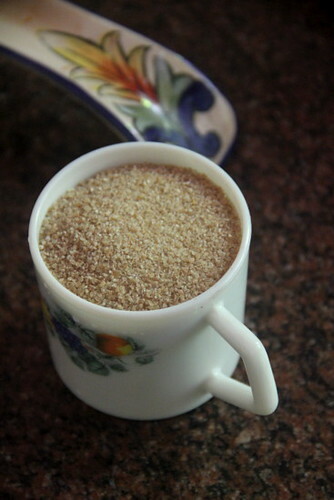 Add dried ginger powder, cardamom powder and combine. Melt 3 tsps of ghee in a small pan. Dump in the coconut bit pieces previously set aside. When it browns well, add halved cashews and fry until they turn golden brown. The coconut bits should be one or two shades darker brown in colour. 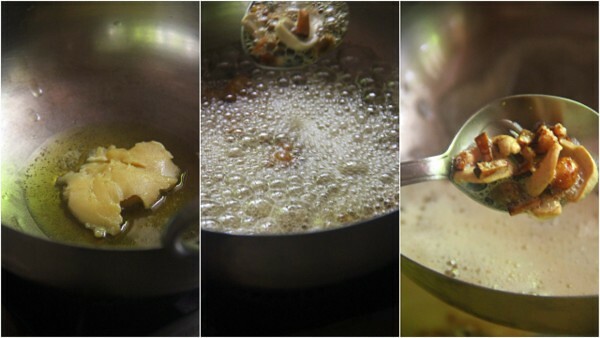 Pour over the payasam and combine gently. 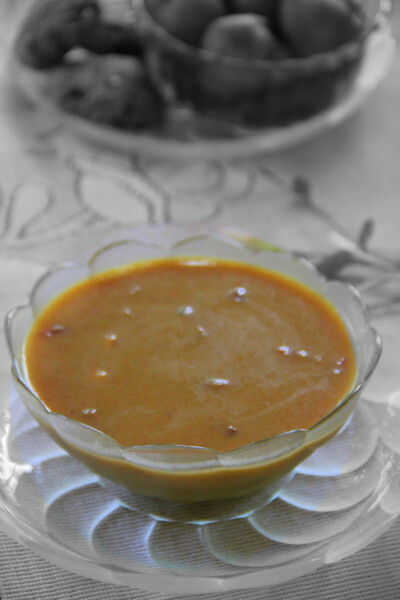 Godhambu Rava Payasam tends to get thicker while cooling down. Refrigeration makes it creamier. If you prefer thicker and sweeter version, serve hot or cold in katoris or small dessert bowls. 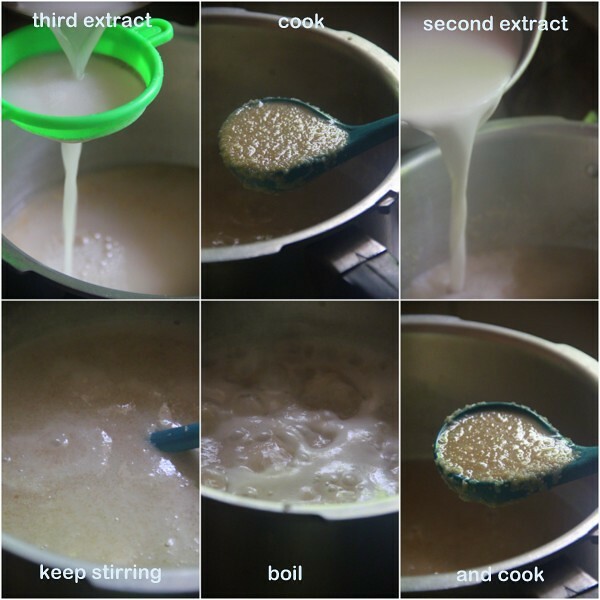 If you find it too thick and sweet, you may add a cup of hot or warm cow's milk to make it thinner and less sweeter to serve in cups or large bowls. one of my favourites, so yum! This is our family's favourite dessert! It has the goodness of wheat and the sweetness we love! You didn't mention all the ingredients unfortunately, I would like to know how much grated/shredded coconut can be used for frying in ghee. Thanks.